LG Optimus L4 II is a 3G smartphone with optional dual sim. 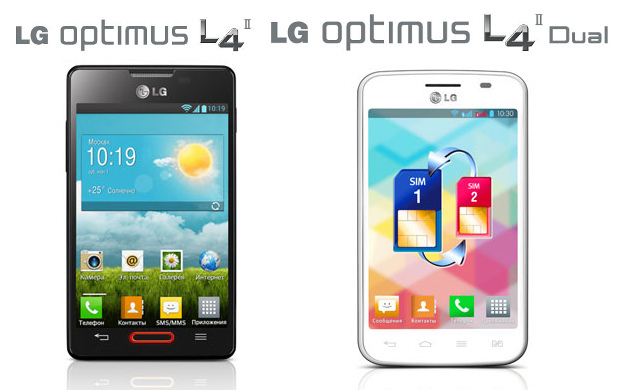 It will be available in two models E440 (Single sim) & E445 (Dual sim). This smartphone from LG with moderate specifications will be targeting the entry level market. The Smartphone features a 3.8 inch True IPS Capacitive Touch Screen, Multi Touch Display with resolution of 320 x 480 pixels, ~152 ppi pixels density. There are two colour options viz Black & White. Beneath its skin it holds an 1 GHz Cortex A9 Processor, MediaTek MT6575 Chipset, PowerVR SGX531 GPU, 512 MB RAM. It will come out of the box with Android OS v4.1.2 (Jelly Bean). The internal memory is mere 4 GB with support upto 32 GB microSD. On the rear it holds a 3.15 MP Primary Camera with LED Flash, Geo Tagging & resolution of 2048 x 1536 Pixels. There is no Secondary Camera. It has other features like Wifi, Wifi HotSpot, Bluetooth v3.0, microUSB 2.0, GPS with Support for A-GPS, FM Radio. It has a battery juice of 1700 mAh.